Next→Should You Play Left-Handed or Right-Handed? In general, if you ask enough people about the best way to learn guitar, most of them would suggest taking lessons. That’s because most people have some experience with music lessons, at least enough to know that it can be more helpful than just hacking away at your own. However, occasionally you’ll meet someone who will tell you not to waste your money on lessons. Why would someone advise against it? In many cases, this person had a bad experience with lessons. Unfortunately, there are too many unprofessional music teachers out there, and they’re giving everyone else a bad name. Musicians are not always balanced people. Some people who have spent years learning an instrument didn’t manage to pick up any other marketable skills in the mean-time. This means that a number of private teachers aren’t really committed to teaching, and are only doing it because they have no other place to go. 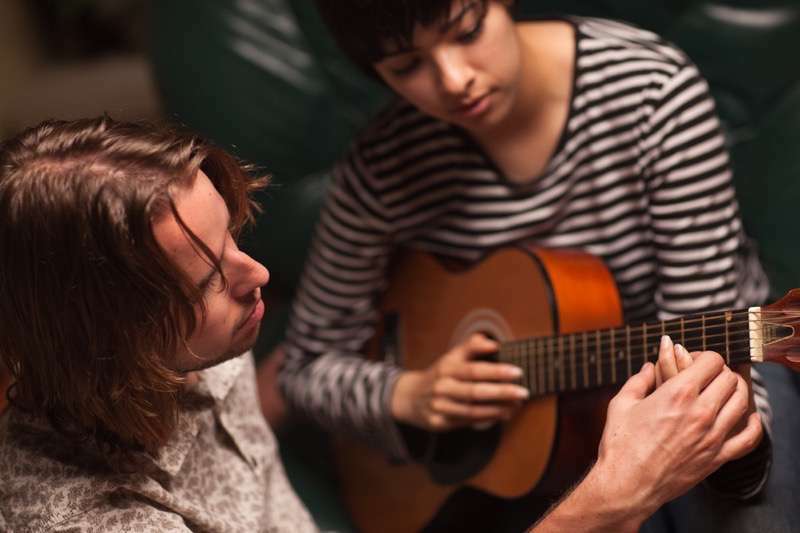 A good teacher can save you lots of time by helping you to avoid bad habits, identify your critical practice path, and choose music that suits your level—allowing your guitar learning process to flow smoothly and evenly. But Why Can’t I Learn Everything Online? As more lessons are published online, that will only increase the need for good teachers to guide students through the material. A teacher is more than a repository of lessons. A good teacher is a guide and coach that helps you plan your attack. What Are the Benefits of Private Lessons? What are the Disadvantages of Private Lessons? If you want to avoid ending up with a bad teacher, check out our tips for choosing a guitar teacher. If you can’t afford lessons right now, that’s okay. They’re not absolutely required. Financial stress is a normal part of life, even for the rich. If this is the case, it may be best to put off lessons and come back when it fits your budget. You can learn by yourself or online. Another option is to take less-frequent lessons, such as once every two weeks. For students who live too far from a qualified teacher, that’s really no problem these days as long as you have high-speed internet. Some of the best guitar teachers out there are doing their whole show through Skype. Many in-demand teachers have a busy travel schedule, too. Potential students with a difficult travel schedule can also take advantage of Skype. In fact, frequent travel is not a factor if you’re really motivated to learn. You do need a travel guitar, though. Some students meet their teachers from thousands of miles away through the power of the Internet. Even experienced, professional musicians will take lessons from other professionals who have skills they want to acquire. The private lesson institution is ancient and endures for a reason. Find a qualified teacher near you, and reap the many benefits of good instruction. Next articles lesson: Should You Play Left-Handed or Right-Handed?